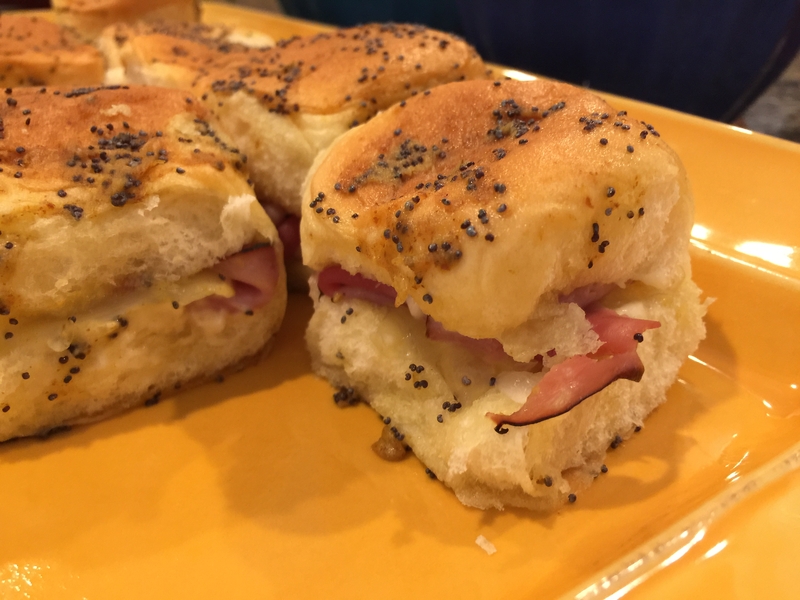 Ham and Swiss Sliders | happy.harvey.home. My party food has gotten a little redundant lately, so for our baby girls’ 1st birthday party I decided to try these sliders instead of my regular pigs in blankets or alternative meat dish. And I’m so glad I did! Let’s just say they went fast and I’m lucky I got to try one! So please excuse the picture, I was planning to get a pretty pic of a full plate of these things but they were almost gone by the time I got to them. A definite winner for appetizers, party food, or just lunch in general for a spin on ham and cheese. Big thanks to my friend Emily who made them while we finished decorating! Hit of the party! In a small bowl, combine mayonnaise and miracle whip. Cut Rolls in halves. Spread mayonaise-miracle whip mixture on each side of the roll. Place a piece of honey ham and Swiss cheese on one half of each roll. Fold back into sandwich form. Place rolls close together in a greased 9×13 pan until pan in completely full. Mix together all ingredients of Poppy Seed Sauce. Spread evenly over the tops of all the rolls. *NOTE* I did not use all the sauce. Let the rolls set until the butter has set up a bit. Cover with aluminum foil and Bake at 350 degrees F for 12-15 minutes. Rolls can be made a day ahead and stored in fridge until ready to bake. This entry was posted in Appetizers, Recipes by annettelharvey. Bookmark the permalink. Pingback: Celebrating 1 Year! | happy.harvey.home.